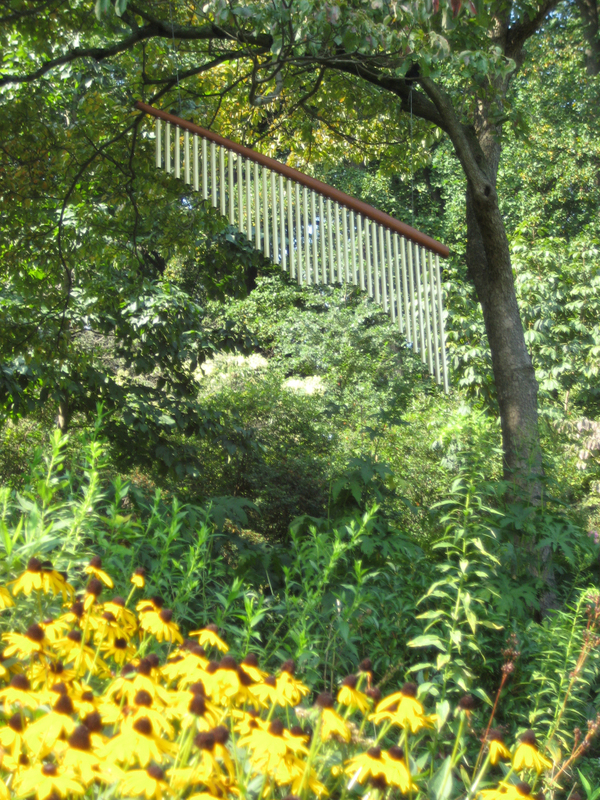 Spectrum Gallery is pleased to have acquired the outdoor installation of Sine Chime, by Peter Dellert. Click here to see the chime on Spectrum Anytime. My sculptures concern themselves with the information both inherent and hidden in the iconic forms and materials of our natural world, often juxtaposed with manmade or found materials. The sculptures are derived from recognizable biomorphic forms, often enlarged or altered and often developed into more minimal statements. While the forms remain unthreatening and familiar, certain details, seams, edges, openings or surfaces speak of additional information unrevealed, requiring the viewer to further examine and question origin, intent and purpose. Inheritance and the related pieces made from recycled found catalytic converter covers typify this process, using castoff industrial parts to make a large flower or pod shaped piece. The juxtaposition of manmade / organic is intentional and points out the irony in making a beautiful flower shaped sculpture out of rusted car parts, as well as identifying the source of much of the pollution being produced globally. Peter Dellert is a furniture maker, sculptor and collage artist living and working in Holyoke, MA. Inspired by nature and biomorphic forms, his sculptures are made from such diverse materials as tin cans, tree branches, steel re-bar, carved Spanish cedar, concrete, and found recycled automotive catalytic converter covers. They have appeared in shows such as Sculpture Key West, Contemporary Sculpture at Chesterwood, Sculpture New Hope, and Sculpture Now. In 2015 his work was exhibited in Art in the Park (Worcester, MA), Art in Nature (Fruitlands Museum, Harvard, MA) ,Sculpture Now at the Mount (Lenox, MA) and Art in the Orchard (Easthampton, MA). This summer Bound Egg will be shown at The Mount, Hope will be installed in New Hope, PA, and Sine Chime is showing at the Spectrum Gallery in Centerbrook, CT. His sculptures and collages have been shown in numerous one-man exhibitions and included in many publications, most recently in Creating Abstract Art (Northlight Books, 2014).